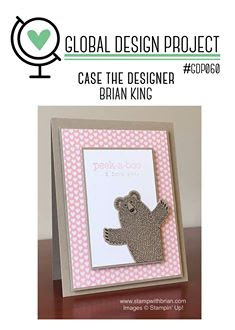 I've taken a lot of inspiration from the gorgeous card to case from Global Design Project #GDP060 by one of my favourite human beings - the amazing Brian King!! I hope you all love this cute card as much as I do! I've made it for my husband's lifelong mate, who's partner has just given birth to a beautiful little girl called Lily! I've stamped the bear's face in Wisteria Wonder & the little white heart on the bear is also from the Cookie Cutter Punch. Once I've stuck the bear in place with my Tombow Multipurpose Glue on the Whisper White cardstock, I've trimmed off the legs so it fit nicely in the corner. Then I've added all the other layers together & propped the middle up on Dimensionals. The sentiments & stars come from the Made With Love stamp set. I have followed suit inside with a layer of Pink Pirouette & Whisper White & used more of the stars & another sentiment from the Made With Love stamp set.